So, my sister found this super fun activity for us to do with our girls on Saturday called "Snack with Santa." 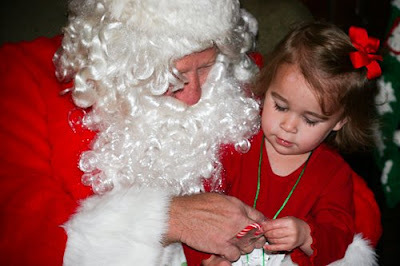 (Check out last year's "Breakfast with Santa" for a flashback!) The girls seemed to have a lot of fun, and it was a great way to start getting into the holiday spirit. 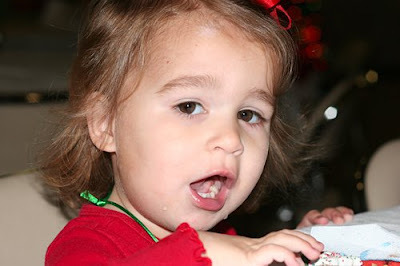 Although, I'm pretty sure Eleanor thinks it's Christmas right now, and she won't stop requesting to hear "Jingle Bells." 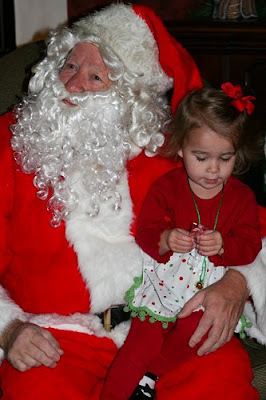 First, Eleanor sat with Santa, but only because he gave her a 'John McCain.' She seriously kept calling the candy cane "John McCain," which is going to make me laugh for a really long time. The girls (read 90% mommies) decorated goodie bags. 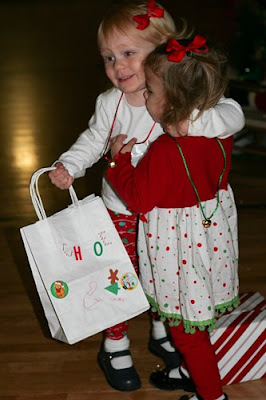 Here's Chloe holding hers while giving El-nor a super big hug. This happened at snack time...not sure what this face is about, but it sure cracks me up! PS- Before you think I have totally become the snapshot-only queen, you can check out some recent photo sessions over here at the photo blog. What a beautiful little girl!! 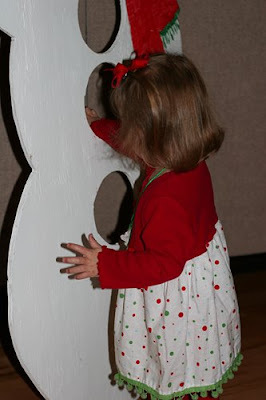 I checked her Breakfast With Santa pictures; boy, how she has grown and changed!!!!!!!!!!!! Hope this santa wasn't as crabby as the one last year! That candy cane story is hilarious! HAHaHAHA I love the "John McCain". That is priceless! !